It’s been a busy few months for me! I’ve moved to a new city and started a new job. Most recently, my job took me up to Moose Factory, Ontario. It’s primarily a Cree community about 10 kilometres south of James Bay (the southern-most section of Hudson’s Bay) on the Moose River. It was just gorgeous, truly a winter wonderland from mid-November onwards! All to say, when I got home to Ottawa this past weekend, I was craving a big and varied veggie stirfry. I decided to make one of my favourite recipes, Lotus Land Linguini from rebar: modern food cook book. This medley of crisp veggies with a delightful spicy & creamy peanut sauce continues to be one of my absolute faves. In it’s original form it’s vegan, but as a special treat I added some shrimp. And to keep with the Asian theme, I served it with rice noodles instead of linguini (making it gluten-free too!). I have yet to meet a friend or family member who hasn’t asked for the recipe. Just the culinary treat I needed!! While I love my organic vegetable box, I am apt to find myself overloaded with root vegetables come winter. And as much as I love eating carrots, beets, carrots, carrots, turnips, carrots, parsnips, and carrots yet again, I find they easily become boring mid-winter. I’m always looking for new ways to make them more exciting. While planning a dinner for friends (and trying to use up my accumulated root veggies collection…), I remembered a simple, yet delicious dish my aunt and uncle served me most recently at Thanksgiving (thanks Liz&Dan!). They make a fabulous 7-veggie roasted root vegetable mix, combining the earthy combination of onions, celergy root, turnip, sweet potatoes, potatoes, carrots, and parsnips. To dress up the veg, they toss them not only in oil prior to roasting, but also balsamic vinegar, which results in a delightful glaze. This dish is easy to prepare, but requires some time to peel and chop the root veg. My aunt and uncle usually leave out beets, as the vibrant red stains other vegetables, but beets are one of my favourites, so I tried this recipe with candy cane beets. It worked out great if you can get your hands on some (no staining!) or golden beets would also be a good work around. I’m also a fan of roasted brussel sprouts, so included them in my mix. Feel free to use whatever mix of vegetables you love. The leftovers are great reheated or served cold with some leafy greens. Prepare root veggies by washing, peeling, and then chopping them into ~2 cm (3/4 inch) cubes. If using, clean and trim the Brussels sprouts and leave whole or halve if large. In a large bowl, toss veggies with oil and vinegar and herbs to taste. Transfer to a large baking dish (e.g. 8×13 Pyrex) and bake for ~75-90 mins, or until vegetables are baked through and sides are browned. Stir roasting veggies every 20-30 minutes to cook evenly. Inspired by the changing autumn colours, the crisp morning bike rides through the streets of Ottawa, and the bountiful harvest, I sometimes feel like I cannot satisfy my desire to cook at this time of year. There are so many things I’d like to make! 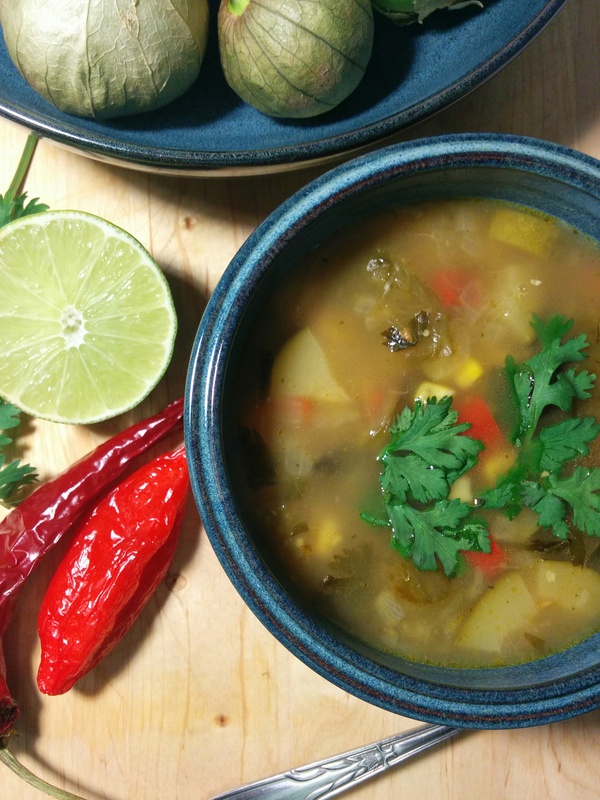 This soup is inspired from rebar, a fantastic cookbook Catherine has already talked about. What I love about this soup is the tangy, rich and spicy flavour, in the form of a light soup. It is simply delicious! Preheat oven to 425. Cut the tomatillos in half and place in a bowl with the olive oil, the chili and 1/4 of the garlic. Toss with salt and pepper and then place in a large enough baking dish that they can all be roasted without being piled up. Roast in the oven for 35-40 minutes until they are browned and roasted. Cut in quarters and set aside. In a saucepan, bring the stock to a simmer, with the corn kernels. In a large soup pot with a lid, heat the olive oil. Sauté the onion until it softens. Add the red pepper, the garlic, coriander, salt, and sauté for a further 3 minutes before adding the zucchini. Once the zucchini is in add the minced cilantro and stir, until the veggies are soft and the garlic is fragrant. Add the stock and lime juice and bring to a boil. Simmer the mixture for 30 minutes, then add the roasted tomatillo mixture. Taste and adjust seasoning with salt and pepper. Simmer for another 15 minutes. Add cilantro leaves for garnish. This is a delicious tangy soup you can have as a full meal with fresh corn bread or as a first course in a bold autumn feast! As Sitelle and I live a few hundred kilometres apart, it’s always a treat when we get together for dinner. We had the pleasure of dining together last week, and I knew I wanted to cook something easy and fun involving the grill, as I was cooking for a small crowd (my parents and her fiancé joined in on the party!) We started with her tasty kuri squash soup and ended with my favourite dessert of all-time, raspberry glacee pie. All in all it was a lovely escape from the hectic life of a medical clerk! Shish kabobs are one of my favourites – and with all the gorgeous fresh produce (ripe cherry tomatoes! perfect yellow zucchinis! fresh red onions!) at the farmer’s market in Ottawa, I couldn’t help but be inspired. Who doesn’t love meat cooked by fire (not to mention veggies cooked by fire)?? I love the hint of rosemary in the marinade as it keeps the meat tasting fresh. Whenever I make these kabobs, I usually try to use a high-end cut of meat. The marinade will tenderize the beef regardless, but as the recipe calls for little beef, it’s always special to splurge on the high-end nicely marbled cuts. Feel free to mix up the type of veggies – the combination below is the classic choice in my family. If you are feeding vegetarians too, it’s easy to simply leave off the meat on a skewer or two. I usually have leftover veggies after threading all the skewers balanced with beef and veggies anyways. With these extra veggies, I cook them on a separate skewer or simply in a large basket for the BBQ. Charred vegetables make for great leftovers! To make the marinade: In a bowl, stir together the olive oil, vinegar, garlic, sugar, rosemary, and pepper. Place the beef cubes in a large sealable plastic bag and pour in the marinate. Seal the bag and marinade at room temperature for at least 1 hour or preferably overnight in the fridge. About half an hour before you want to start grilling, combine the vegetables with the oil and seasonings. Toss gently to combine. Place the beef in a bowl and discard the marinade. Thread the beef and vegetables on the skewers, dividing them evenly, until the skewers are filled. Start and end with a vegetable on your skewer as often the grill isn’t as hot near the edges. Prepare a hot fire in a grill – either over hot coals or high propane. Place the skewers on the grill directly over the heat. Cook for 3-4 minutes, then turn the skewers with tongs. Continue cooking for 3-4 minutes more for medium-rare or longer for well-done. The veggies should be cooked but firm and nicely charred, while the meat should give easily when pressed. 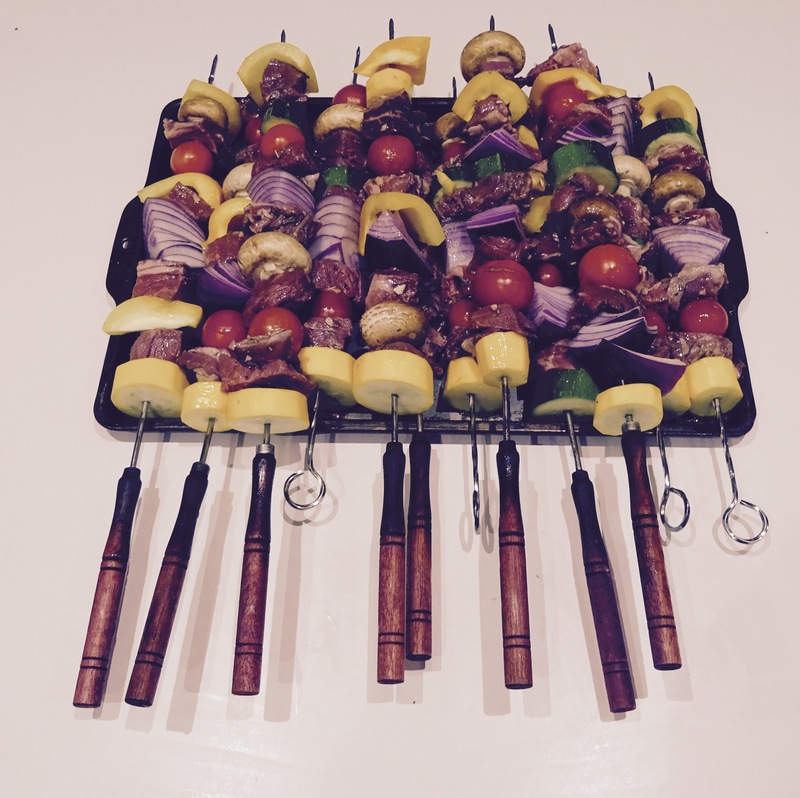 To serve, slide the beef and veggies off the skewers onto a platter and enjoy. As a senior medical student, I am learning the foundations of being a good doctor, spending anywhere between 40 and 90 hours each week in the hospital. While I generally love my work, it often leaves me drained and pinched for time (especially after a 26 hour call shift!) My meals have therefore become simpler (and make in abundant quantities to last a few days), but I haven’t stopped cooking. I have been guilty of neglecting Gourm(eh)? over the past year, but hope I can make up for it with a few summer recipes over the next few months! One of my favourite things is receiving my biweekly organic food boxes from Front Door Organics. They deliver gorgeous fruits and veggies right to my front door – and in the summertime, I love choosing their local Ontario produce. It’s always a treat finding veggies you just can’t get at the grocery store, such as sweet purple carrots, colourful watermelon radishes, and tangy micrograms. I love potato salad all year round, but in the summer I try to avoid heavy mayonnaise dressings. The recipe in my most recent food box caught my eye. Inspired by local veggies now in season, their potato salad has a light lemony vinaigrette. 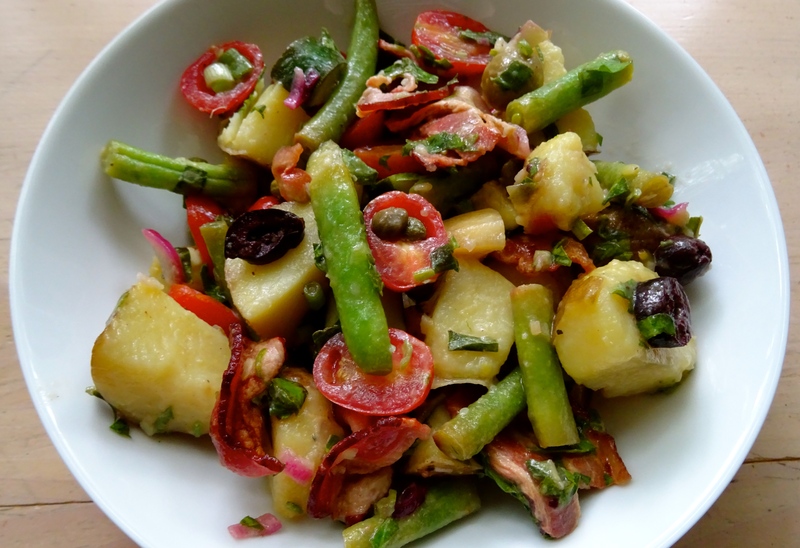 Below is a modification of their suggested recipe of the week – Simple Summer Salad with Green Beans & New Potatoes. Being an omnivore, I substituted their cubed smoked tofu with bacon, but it would be easy to return to their vegan recipe. This summer salad was delicious. I was too excited to chill this recipe for 30 minutes before trying it, but it was even better cold as leftovers the next day after the marinade had mellowed the salad. To prep the salad ingredients, start by boiling the new potatoes in salted water until tender, about 15 to 20 minutes. Drain and immerse potatoes in an ice bath to cool. Blanch the zucchini and green beans in salted water for 1-2 mins, then drain and also immerse in an ice bath to cool. Remove veggies from ice bath and allow to air dry (don’t keep them in the ice bath for longer than 2-3 minutes to avoid getting soggy). Meanwhile, cook the bacon and prep the other veggies. Place all the salad makings together in a large bowl. Whisk the vinaigrette ingredients together, then pour over the salad. Gently mix. Refrigerate for 30 minutes and serve. If you’re looking to find some warm colours and comforting flavours on this Ontario Election Day, look no farther than this simple farmhouse vegetable stew! This recipe created itself from the remaining vegetables in my CSA box this week, and I’ve already put it into jars as I’m looking forward to sharing some with someone this weekend! Dice the onion, and then sauté over medium heat in the olive oil in a stockpot. Once the onion is soft, add the remaining vegetables and cook and stir for 5 minutes or so, until fragrant. Sprinkle the flour onto the veggies and stir to coat. Add the hot vegetable stock and hot milk, and bring to a simmer. Allow the whole soup to simmer on low for 45 or so minutes, with the lid partially on to prevent too much evaporation. Serve hot with grated parmesan and crusty bread! With the school year behind us, Catherine and I are both setting out on our summer holidays. Catherine is off traveling (her turn) in South America, and I am discovering what Ottawa has to offer during the summer months, as it will be my first summer in the capital! One of the highlights so far has been receiving my first CSA (Community-Supported Agriculture) box last week! It included a wonderful medley of winter and spring veggies, pasture-raised meat, beautiful and flavourful eggs, and a hearty loaf of home-baked bread which I devoured with some friends on our way to a hike in the Adirondaks for the weekend. Needless to say, I am excited to dedicate some time to some new and hopefully inspiring recipes this summer, with the inspiration provided by my good food box, and the relative calm of the summer compared to the last few. Today, as I begin some work from home, I took a break on the patio and read the LCBO’s Early Summer magazine in search of some new ideas. I came across the Crunchy Tangled Vegetable Salad, and immediately was inspired. 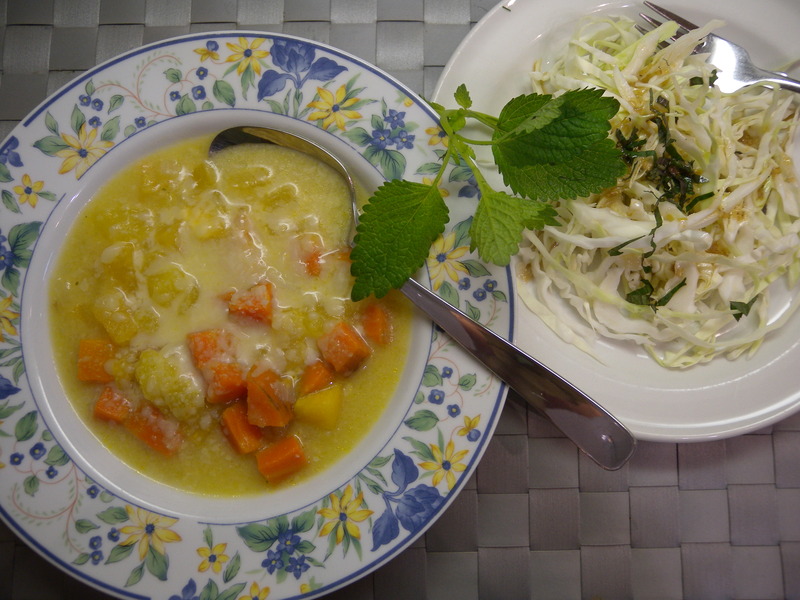 While I have not made their recipe, it gave me a guide and I made a meal with what I had. 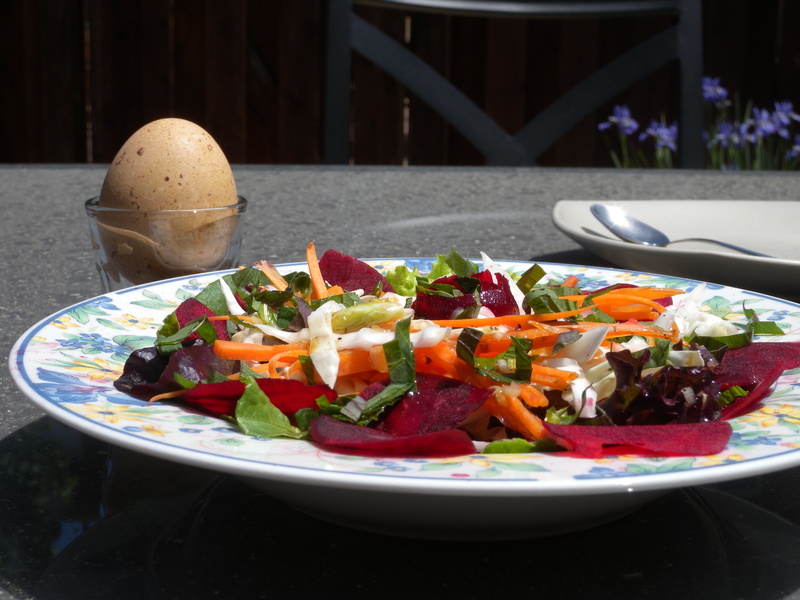 The salad I made is refreshing, crunchy, filling and tangy; and it was accompanied by a fresh soft-boiled egg which provided just the right balance. Combine the dressing ingredients in a jar and let stand while preparing the vegetables. Finely slice the vegetables and herbs as directed in the ingredient list and combine into a salad bowl or arrange on plates. Drizzle with dressing, and serve with a soft-boiled or hard-boiled egg if you desire!